While trying something new in real life, it would be great to take advice from someone who is expert in that area. 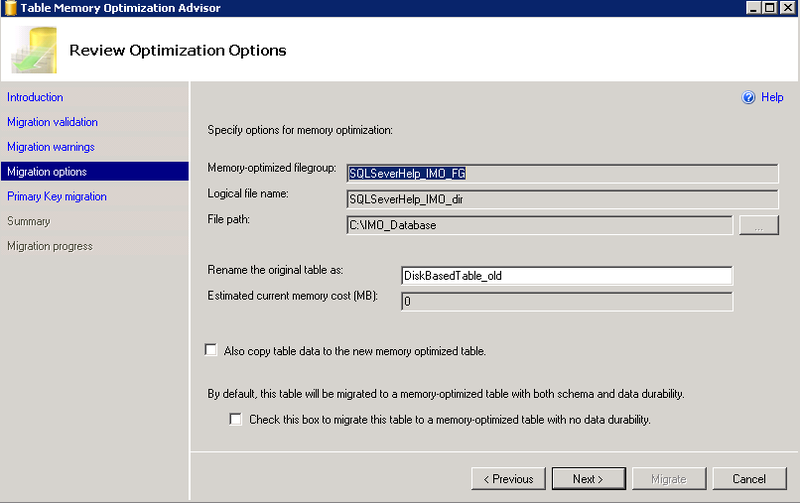 On the same lines, SQL Server Management Studio can help us as “advisor” about migrating disk based tables to In-Memory Tables. 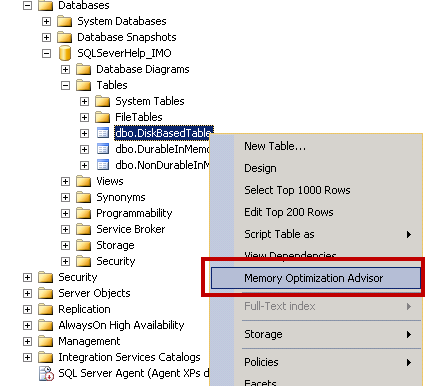 Here is an earlier blog about various SSMS enhancements to support In-Memory objects handling. 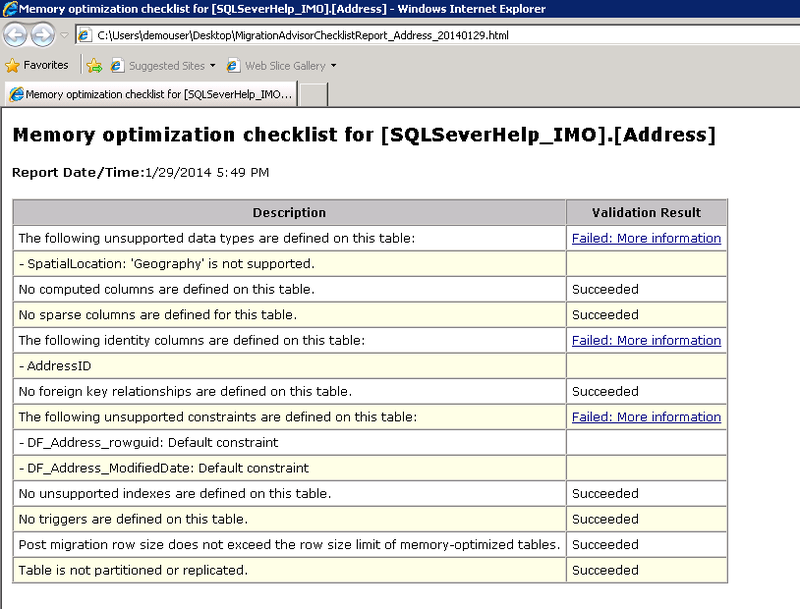 As always, most of the wizards are in the right click on node of SQL Server Management Studio (SSMS). This option to launch this wizard would come once we right click on a disk based table, as shown below. Note that it won’t be visible if table is already in-memory table. Clicking Next would take us to “Memory Optimization Checklist” screen. 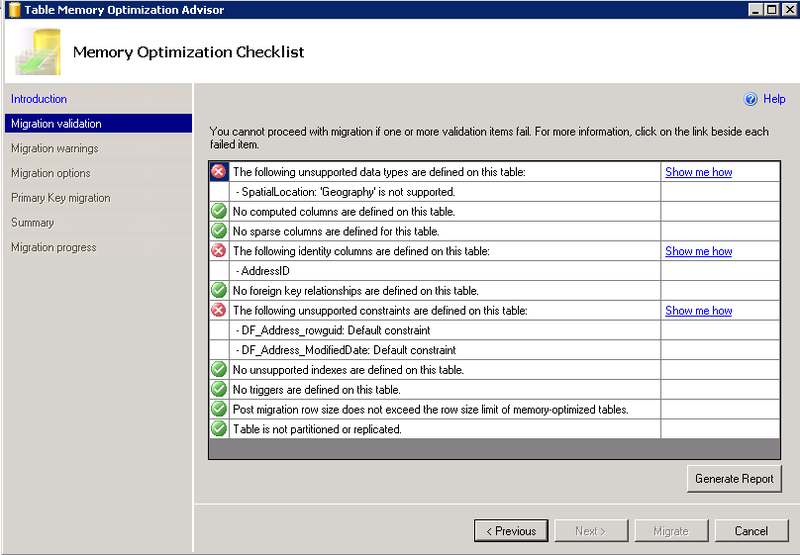 This would perform checks for the schema of the table and warn about limitations of in-memory table. My table was a simple DiskBasedTable which we have used in earlier blogs, so all green. Note that my blog posts are on CTP2 and few limitation might be removed in RTM so below checks might change. and if we run wizard for above table, we would get below screen with few red crosses. Try to compare the errors with the definition above. Because of these errors we can see that “Next>” button is grayed out. 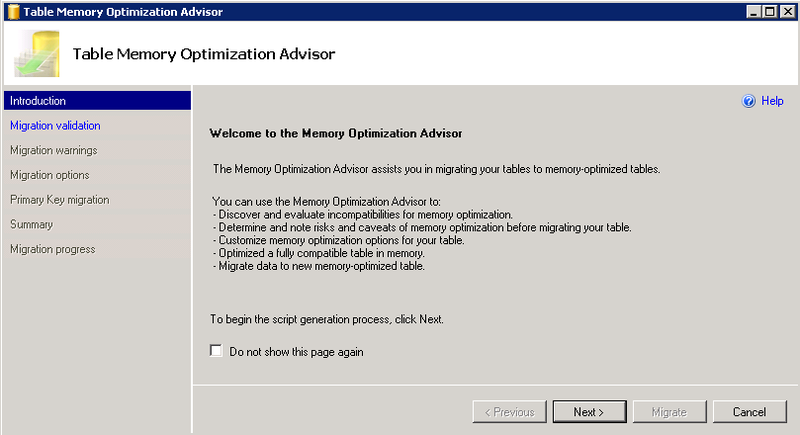 We must resolve these problems before this table can be migrated to an In-Memory OLTP table. We can also use “Generate report” and get HTML file which would have hyperlink about each “show me how”. 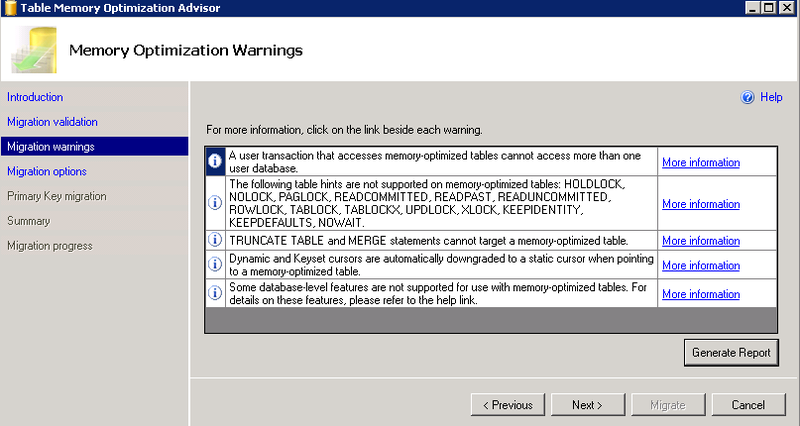 These Information messages allow us to understand the limitation of usage of In-Memory OLTP tables. To know “More” about each, we can click on the hyperlink that says “More Information”. More Information would open this link. http://go.microsoft.com/fwlink?LinkID=306707 Let’s hit Next now. Once we provided the options in all previous screens, next screen is “Verify Migration Actions” which is summary of the actions selected in previous screens. If we click on migrate, the script would be run automatically by the wizard. 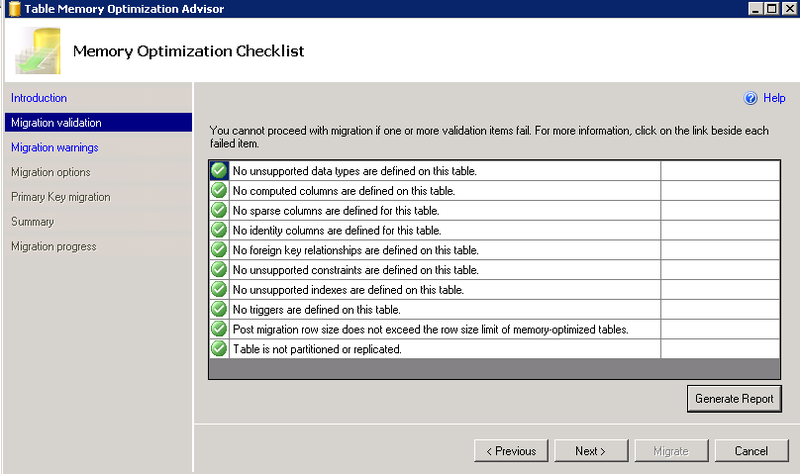 As we can see that wizard can be very useful to migrate a disk based table to an In-Memory OLTP table. It can help us in identifying the things you have to do to a table in order to migrate it. After resolving all the issues we can either generate script to migrate later or use wizard itself to run script.